Kernel SQL Database Recovery 13.05.01 - Download Win Apps. 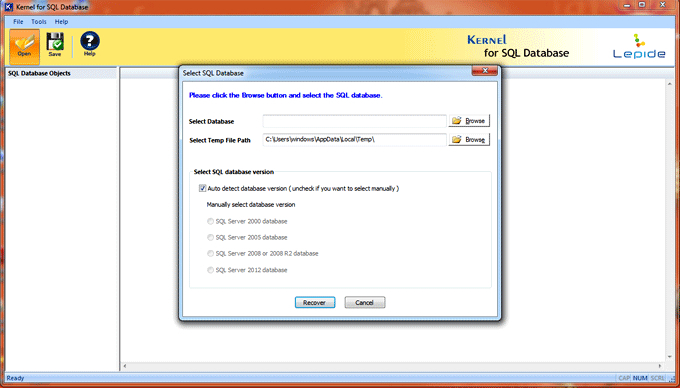 Use Kernel for SQL database repair tool and resolve all SQL database issues. .MDF files are the backbone of SQL server database. When they get corrupt or damaged, you cannot perform your task in proper way as it behaves in an unexpected manner. Your valuable SQL database also face a great risk of permanent data loses. By using Kernel for SQL server repair tool, you can repair, recover and restore inaccessible MDF database efficiently.